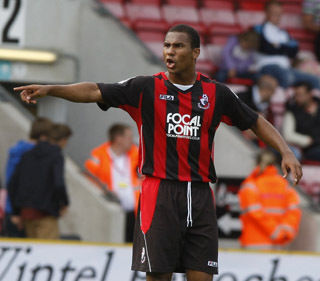 Director of Football Dave Malone has announced the signing of Bournemouth defender Mitchell Nelson. Damien Scannell has returned to the Silverlake after departing from Eastleigh to Southend United for £5,000 nearly four years ago. Scannell started lively and set up Graeme Montgomery a wonderful chance to put Eastleigh 1-0 up three minutes gone, however the on loan Aldershot Town winger fired hopelessly over bar. Montgomery redeemed himself twenty-five minutes later when he netted a fantastic half volley which crept in after Craig Holloway got a hand to it. Billy Tsovolos who had to fill in for the absent Ali Fuseini (who has been jailed for ten weeks after twice being caught driving while banned as Southwark News reported today on Twitter) put Eastleigh 2-0 up after the central midfielder raced into the penalty area and blasted an eight yard strike into the back of the net. Jamie Brown put Eastleigh 3-0 up four minutes later after the striker turned his marker and finished with a superb strike. The game looked all but over until last placed Thurrock had a bit of magic in Nathan Ashton who scored an unstoppable strike, eight minutes from time. Michael Green fouled a Thurrock player in the penalty area and Jamie Guy put the visitors one goal away from a point. 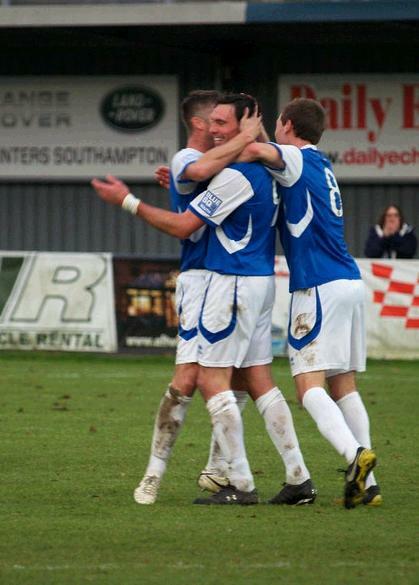 The Spitfires stuck out the last couple of minutes and claimed all three points much to Eastleigh fans delight. Eastleigh now play tenth placed Boreham Wood at The Silverlake Stadium on Saturday (3pm kick off) as they try to overtake The Wood in the league. Boreham Wood’s last game was in The FA Trophy first round where they hosted Blue Square Bet Premier outfit Cambridge United where they lost 0-1 at Meadow Park. The Wood have not played a league game in three weeks which was away to Basingstoke Town, the match finished 1-1 with Luke Garrard scoring Boreham Wood’s only goal. Sam Lechmere’s corner was swung in only for it to be half cleared, the ball got crossed in again for Garrard to srike home from ten yards. The Wood have only won two games away this season in the league against Dorchester and Hampton and Richmond both being 0-1 results. Boreham Wood have only scored seven goals on the road this season out of ten games, having lost five games in total away in the league this season. The last time these two teams met was at Meadow Park where The Spitfires lost 2-1 with Jamie Slabber scoring his twenty seventh goal of the season and Eastleigh’s only goal in that match and a Brace from Mario Noto secured The Wood three points on that occasion. The last time these two teams met at The Silverlake Stadium, The Spitfires won 3-0 and claimed all three points on that occasion. Tony Taggart (Now at Sutton United) opened the scoring with just thirty seconds been played, the winger headed home a Richard Graham (Now at Dartford) cross. Jamie Slabber then set up Richard Gillespie with a great lobbed pass and the now Bashley loanee made no mistake with the finish. Chris Holland (Now at Havant & Waterlooville) then headed in a powerful header after Tony Taggart picked out his man with a great cross which was enough to secure Eastleigh three points. Eastleigh director of football Dave Malone announced last night on the fans forum the capture of AFC Bournemouth defender Mitchell Nelson. Dave Malone then went on to say. This is a great addition to squad for Saturday as the defender has only just came back from Blue Square Bet Premier side Lincoln City. The former Colchester trainee has had spells with Cambridge United, Lewes, Eastbourne Borough and Tooting & Mitcham where the 22 year old first started his career. Dave Malone also announced Eastleigh striker Andrew White has gone on loan to Blue Square Bet South rivals Dorchester Town for an initial one month. This is going to be a great game to watch so come on down to The Silverlake Stadium on Saturday and roar on those Spitfires! Match highlights of the last time Eastleigh and Boreham Wood met at The Silverlake Stadium last season from grantpaynewinchester.